Blood in the Square is a highly readable novel about the world of nationalist politics in Britain of the 1960s. I raced through its 119 pages in a couple of normal working days. This might suggest that it is a well-crafted work by a veteran novelist, with all the tricks of the trade at his command. But although the writer, John Bean, is certainly a ‘veteran,’ he is a veteran of nationalism, not fiction. This work represents his debut as a novelist at the sprightly age of 87! The reason the novel reads so well is that Bean is a natural storyteller and knows his subject inside-out. He has used this deep knowledge of the issues and characters of British nationalism to construct a believable and entertaining narrative that also gives great political insight, especially into the practical problems faced by nationalists in building a movement and getting their message across to a largely unsympathetic audience. The 1950s and 60s was a difficult time for nationalists thanks to recent memories of World War II, relatively low levels of immigration (by today’s standards), and the electorate’s unrelenting focus on economic and social issues, instead of cultural and existential ones. One of the advantages of great age is that Bean writes from a perspective that overarches this entire period, and with awareness of what came before and what comes after. As far as British nationalism goes, he has seen it all. Born in 1927, he was called up for national service in 1945, spending time in both the RAF and Royal Navy in the immediate post-war period. In 1950, after a stint working in India, he joined Oswald Mosley’s post-war Union Movement, before going on to start his own party, the National Labour Party, in 1957. With a socialist-influenced economic focus, this party was designed to appeal to the demographic that was to be hit hardest by mass immigration in the following decades, namely the British urban working class. For this reason, the National Labour Party has served as a kind of template for more recent manifestations of British nationalism, such as the BNP and the present day British Democratic Party, of which Bean is now a member. The National Labour Party later merged with the colonialist-influenced White Defence League, to create the first incarnation of the British National Party, for which Bean stood as a parliamentary candidate in the 1960s. In the 1964 election he got an impressive 9% of the vote in the Southall constituency in North West London, an area that has increasingly been settled by non-Whites, so that today Whites are firmly in the minority (37%). Readers who want to know more about Bean’s long career in British in nationalism are recommended to consult his highly readable and informative biography, Many Shades of Black, which covers his career up to 1999, and this lengthy interview which I conducted with him in 2012. 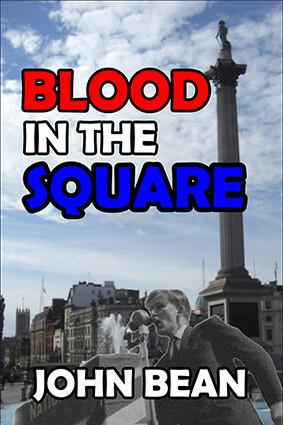 A quicker way to get a handle on the trials, tribulations, false starts, and frustrated promise of British Nationalism, however, is to read Blood in the Square. The novel follows the fortunes of Victor Blackwood, the General Secretary of a small nationalist party, the National Action Movement. This is an obvious stand-in for the early BNP, while the character of Blackwood seems to have at least some of the characteristics of Bean himself. This passage lays open the main dilemma for British nationalists in the post-war period — the need to get media attention by being involved in newsworthy events, which could often be violent, and the dangers this raised of being portrayed as thugs by a media that was much more sympathetic to the Left. Even getting the message out in small street meetings — one is described in the first chapter — was a problem, with speakers facing constant heckling and physical harassment from ideological opponents. But while Bean’s descriptions of the tussles, street fights, and demonstrations are precise and lively, the main interest of the novel arises from the various characters and types that are shown to inhabit this world. Blackwood — his name turns out to be highly ironic — is a crafty but febrile character, an excellent public speaker and sensible tactician, who is all too aware of the difficulties of his position. Bean invests him with a certain fragility that stems from his character flaws — he is unhappily married and unfaithful, while his nationalist idealism is mixed with a strain of cynicism. The root of his bitterness comes from the largely unsuccessful efforts of the NAM to present itself as what it is — a patriotic anti-immigration party with a few rough edges imposed on it by its situation. Despite criticizing Hitler and having a war hero as Party Chairman — the intriguing character of Sir Edric Frampton — the Party is unable to distance itself from smears of Nazism. Its efforts to provide for its own defence allow it to be presented as thuggish, something that effectively alienates it from normal members of the public, while also preventing it from recruiting the kind of people that any healthy political movement needs in order to succeed, namely young, intelligent, well-to-do people. Bean ably explores this dynamic through the novel’s second most important character, Alan Laudersby, an intelligent, young laboratory chemist, who joins the street meeting in chapter one, drawn there by a Rhodesian friend. Laudersby is an open-minded young man with natural inclinations and a common sense outlook. When he hears Blackwood speak, he finds himself in general agreement, and his sympathy is engaged by the unfair tactics employed by Leftist agitators: the meeting is shut down by police after disruption leads to a few tussles. But while the party’s policies exert an attraction on Laudersby, aspects of its street tactics push him in the other direction. These tensions are skilfully brought to a climax by Bean, when Laudersby’s involvement at the Trafalgar Square demonstration leads to his unfair arrest and pressure being exerted on his employers. One of the main criticisms made against nationalists in the period covered by this novel is that they were living in the past and harking back to former glories. A more accurate criticism might be that they were too far ahead of their time, and that nationalism is never more needed than it is today. There is some superficial plausibility to the charge of nationalists of the period being old-fashioned or backward-looking. Groups like the League of Empire Loyalists, of which Bean was a member for a few years, stressed loyalty to an entity that no longer existed, while also expressing an unrequited love of the British monarchy. In Many Shades of Black, Bean recounts some of his own adventures in the League, including one stunt where he and John Tyndall, the later leader of the National Front, were supposed to go and “soot” the writer and broadcaster Malcolm Muggeridge for disrespecting the Queen. Added to such chivalry, there is also the broader ideological perspective. The street politics of Nationalists vs. Leftist in the post-war period — up to and including the National Front in the 1970s — seems like a continuation of the Old Left vs. Old Right struggles of the inter-war years that Greg Johnson wrote about in New Right vs. Old Right, when Fascist squadristi and Nazi brown shirts faced off against revolutionary Communists . Under those conditions, the violence of the Old Right was an understandable response to the violent threat posed by the Old Left. This model can also explain the failure of Mosley’s Union Movement in the UK. In hindsight it was obviously an overreaction to the relatively small threat of Communism in Britain and therefore had few takers. But while many in post-war British nationalism were keen to move on from that unproductive period of struggle, the British hard left was clearly not. This is something that Bean’s novel really shines a light on, revealing both elements of ambivalence among nationalists with regard to Hitler, as well as the paranoia of hard-leftists, especially those of Jewish background, who saw any nationalist movement as a precursor to a second holocaust. The element of Jewish paranoia and extremism is explored through one of the major secondary characters, David Pearlman, a Jewish journalist at a London newspaper, as well as some peripheral characters — members of the 62 Group. This was a gang of Jewish street thugs set up partly in response to the explicitly Neo-Nazi National Socialist Movement created by Colin Jordan in 1962. Even though NAM explicitly distances itself from Nazism, the members of Group 62 see this as mere subterfuge and lump the party in with all enemies of their race. This attitude is demonstrated in the riot in Trafalgar Square, when Blackwood exchanges words with Harry Kidnee, the ‘spokesman’ for Group 62. Kidnee, by the way, is an obvious stand-in for Harry Bidney, the Soho night club manager who founded Group 62. Blackwood, still holding up the banner with a replacement for Charles, saw it was Harry Kidnee. He felt fear. Not of the slight figure of a fifty-year-old 62 Group spokesman (who was alleged to be more interested in the company of boys) but of his followers who had now come into the attack. It is a measure of Bean’s realism and psychological depth that he can present such elements of ambivalence and moral complexity in his characters. Blackwood is all the more human and worthy of our sympathy because he is not some perfect paragon; while, even if we can’t agree with the mindset of Pearlman and Kidnee, there is at least a rationale for it, which elevates them above the level of caricature into that of believable characters. But it would be wrong to conclude from this that the anti-Nationalists are in the right in any way. After all, it is the Nationalist characters like Blackwood and the party’s war hero chairman, Sir Edric Frampton, winner of a Military Cross against the Germans, who are working hard to move their party away from the polarised currents of 1930s class politics to a place where it can address the genuine concerns of a people in the early stages of Third World colonization. Pearlman and Kidnee, by contrast, are still locked in the ancient struggle of the 1930s, and seek to perpetuate it by other means. They are instinctively and blindly acting on the belief that Jewish interests can only be safeguarded by continuing the class war of the past. In the same way that Blackwood and NAM can’t awaken the British masses to their collective interests, Pearlman and Kidnee are equally unable to enrol them in a continuation of 30s class war. Instead they blindly seek its substitute in supporting mass immigration and stigmatizing any expression of British national consciousness. In the small, intense battles and mutual misunderstandings that Bean describes, there is a sense of the rearguard of the past (the Old Left) being engaged by the vanguard of the future (the nascent New Right), but with plenty of historical baggage to throw it off balance and stunt its progress. Bean, through his uncompromising honesty and sympathetic understanding of all his characters, makes this and so much more apparent. For this reason, Blood in the Square should be recognized as one of the classics of nationalist writing.